As dogs age, their bodies become less efficient at metabolizing the proteins that are vital to maintaining muscle mass and overall wellness. In additional to increased dietary protein, senior dogs typically require fewer calories than younger dogs, and fewer carbohydrates help improve insulin resistance. Studies show that it is more harmful than it is good to restrict protein in senior dogs, and the high quality proteins are needed for our older pets. Without enough high quality protein present in the diet, senior dogs lose lean body mass, become lethargic and develop a lowered immune system. To supply the enhanced levels of rich meat proteins needed by elder dogs, ORIJEN SENIOR features the highest inclusions of fresh, never-frozen chicken, turkey, wild-caught fish and fresh whole eggs. 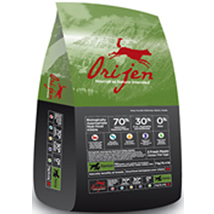 Loaded with protein-packed, government-inspected meats (minimum 70%) that form a Biologically Appropriate diet, ORIJEN is free of the grains or excess carbohydrates that are biologically inappropriate for your senior dog. Deboned chicken, chicken meal, turkey meal, russet potato, lake whitefish, sweet potato, whole eggs, turkey, chicken fat, salmon meal, salmon and anchovy oils, salmon, natural chicken flavour, sunflower oil, sun-cured alfalfa, dried brown kelp, carrots, spinach, peas, tomatoes, apples, psyllium, dulse, glucosamine Hcl, cranberries, black currants, rosemary extract, chondroitin sulfate, sea salt. Chicory root, licorice root, turmeric root, fenugreek, marigold flowers, sweet fennel, zea mays, peppermint leaf, chamomile flowers, dandelion, summer savory, rosehips.